At Perth Temporary Fencing, we embark on designing modular systems manufactured using only 100% recyclable polypropylene Coreflute with timely installation and removal. Our temporary hoarding fences are designed using best-quality 4mm temporary fence panels. These frames are filled with 5mm polypropylene Core Flute Sheets for effective support and protection of the worksite. We ensure that the fence remains standing and secure once installed. The panels are fitted with temporary fence stays that provide support in high-wind situations. These fences are made using high-density polypropylene plastic sheets that aren't just supporting the fence, but also give it a clean and exquisite finish. Safe and durable Temporary hoarding. Even and exquisite customer-facing front. Opportunity for displaying graphics either printed or vinyl attached. Resistant to wear and tear and can be used many times over the years. Seamlessly fit the landscape of the site. Hold competitive edge over timber and steel hoarding. Get a hardy and aesthetically pleasing temporary hoarding fence in Perth or Alkimos for security and visual block out. Get in touch with Perth Temporary Fencing for timely and affordable fence supply and installation service. PTF interlocking Hoarding Fence comes with clamp connectors, which ensure that the fence stays upright in a cold stormy night. 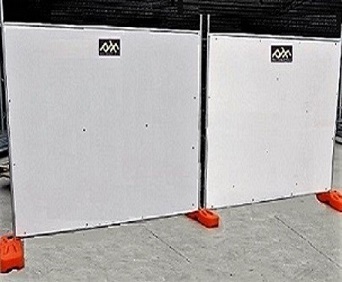 Our top-quality fences can also be used as crowd control barriers, preventing the inline breakthrough of the crowd. Our expertise is not limited to temporary hoarding fences. We embark on stocking crowd control barriers, temporary mesh fencing and temporary pool fencing. Moreover, all our products comply with the Australian Standard AS 4687-2007 and are designed to deliver the highest level of customer satisfaction. Our staff are trained for carrying out safe installation and removal of temporary hoarding fences. We are also a Member of Housing Industry Association, Temporary Fence Association Australasia and Australasian Wire Industry Association. PTF is fully insured for public liability, thereby ensuring your safety and satisfaction. Enjoy the sense of freedom and security – get in touch with the experts at PTF for all your temporary fencing requirements.